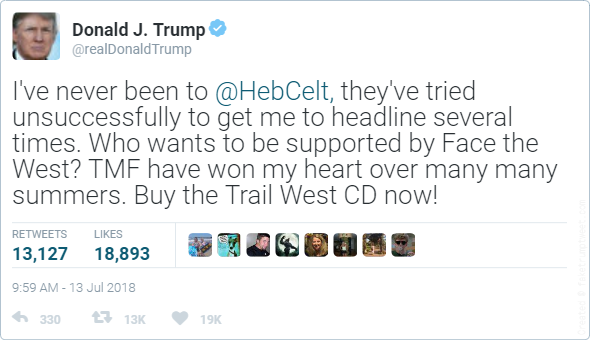 Even though this year’s festivals don’t clash, one Leodhasach ex-pat has decided to head to sunny Tiree for the Tiree Music Festival instead of his hometown’s Hebridean Celtic Festival anyway. Donald John Trump, from Tung, who works offshore in Washington DC, has decided to postpone a golfing weekend in Turnberry, in order to visit the popular West Coast festival which starts today. Trump had previously stated that the response of Tiree locals when the festival was flooded out in 2015 was a great example to his own government’s emergency services working in Puerto Rico after Hurricane Maria. 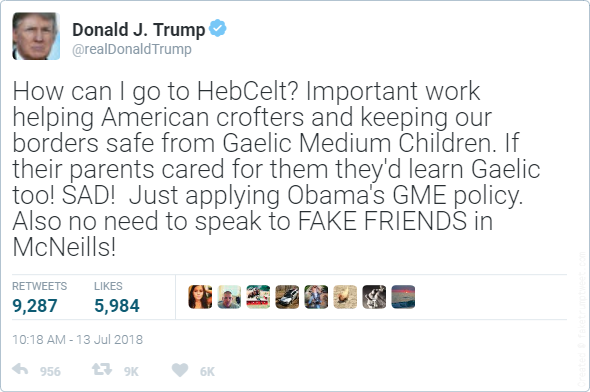 As per usual, Trump engaged in an early morning Twitter rant where he simultaneously praised the Skerryvore inspired event and American crofters, whilst taking potshots at not just the award winning HebCelt, but perennial favourites Face the West and critics of his Gaelic Medium Education policy.